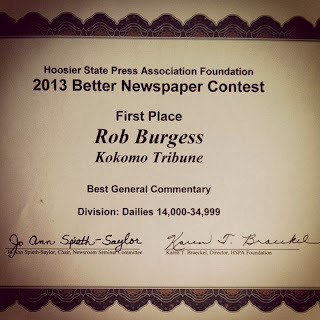 On Dec. 7, 2013 at the 2013 Hoosier State Press Association Foundation Better Newspaper Contest Awards Luncheon and Newsroom Seminar at the Indianapolis Marriott North, I officially became an award-winning journalist. 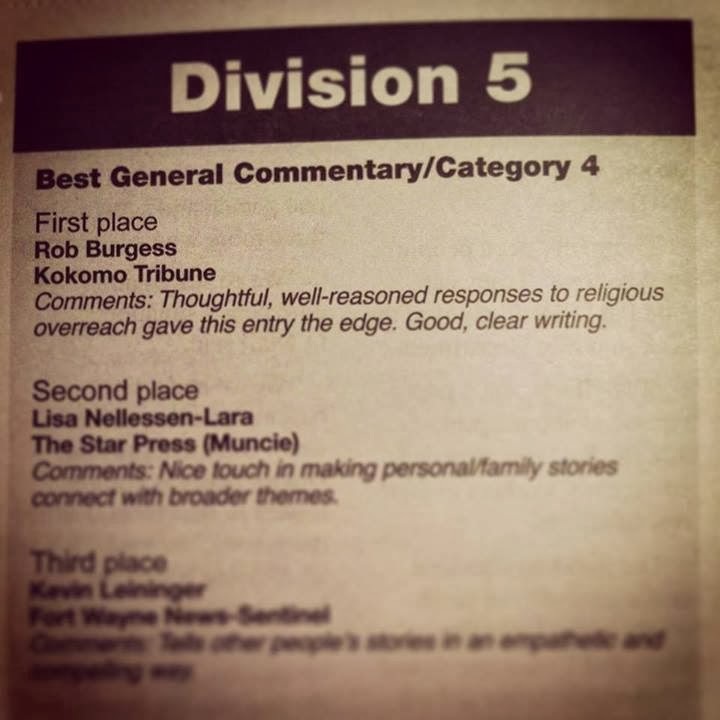 I won First Place for General Commentary for Division 5, which comprises daily newspapers with circulations between 14,000 and 34,999. 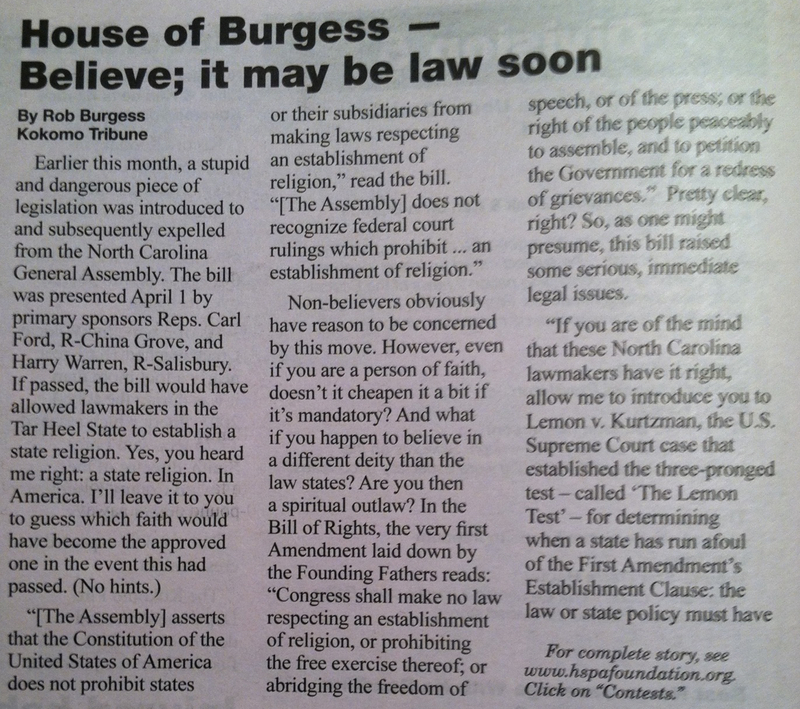 Although I submitted the required three columns published in the Kokomo Tribune between July 1, 2012, and June 30, 2013, my April 17, 2013 column, "Believe; it may be law soon," was singled out by the judges, who said my "thoughtful, well-reasoned responses to religious overreach gave this entry the edge. 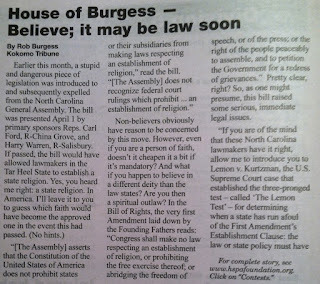 Good, clear writing." You can download a copy of the awards tab here, and winning stories here. 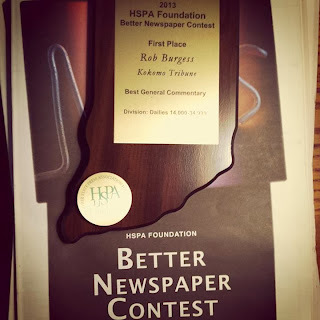 The Kokomo Tribune brought home six first place awards from the annual Hoosier State Press Association Better Newspaper Contest. 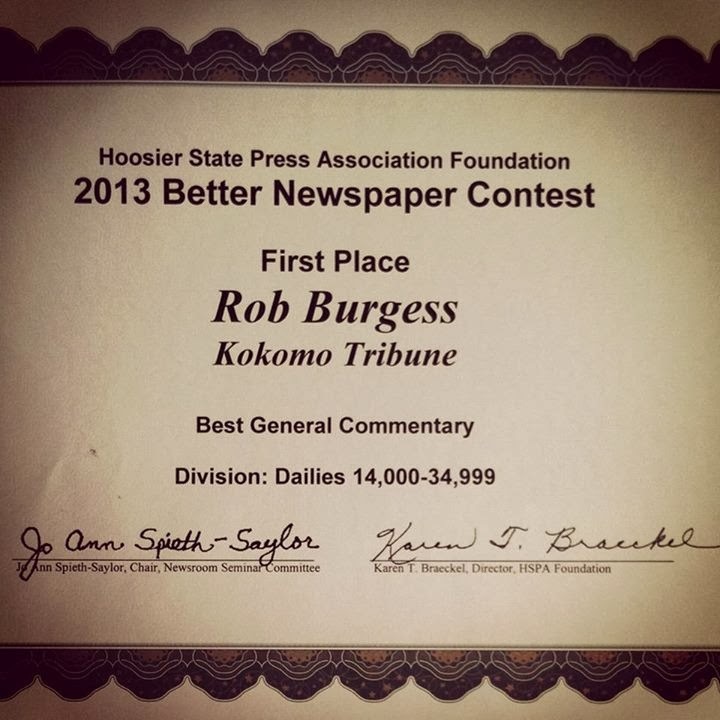 The awards were announced during the annual luncheon Saturday in Indianapolis. “Our reporters, photographers and editors offered readers quality community journalism within the past year, and our peers recognized our efforts,” Tribune editor Jeff Kovaleski said. Reporters Mike Fletcher, Lindsey Ziliak and Ken de la Bastide were recognized with a first place award for their deadline reporting on the record flood that occurred April 19. Judges commented that the stories gathered the day of the flood hit home. Former Tribune enterprise editor Ken de la Bastide earned first place for community service for a series of stories on the state of trauma care in Indiana. The judges commented that Bastide’s reporting showed a community issue that could potentially affect any person. Photographers Tim Bath and Kelly Lafferty earned several awards for their work. Bath placed second for best spot news photo, first place for best general news photo and second for best sports feature photo. Bath was also a finalist for news photo of the year. Lafferty won both first and third places in the best feature photo category and first and third places for best still photo story with audio or video story. The Kokomo Tribune competes with newspapers with circulation up to 34,999 – about 15,000 more than its daily circulation count.